Heat the oven to 200 C and line the base of a 20 cm round springform with parchment paper. For the crust, crush 200 g speculaas and press into the bottom of the tin. Set aside as you make the filling. If you don’t have speculaas, mix 140 g crushed digestive biscuits with 85 g melted butter instead and pre-bake for 8 min. Crushing the biscuits is easiest in a food processor. If you don’t have one, you can put them in a plastic bag and bash with a rolling pin, but I find that the bag easily rips leaving crumbs all over the place. So I have yet another solution: put the biscuits in a bowl and use a potato masher, works a treat! Prepare the filling: in a bowl, beat 500 g full-fat soft cheese (I used Campina, but Philadelphia is good too) at low speed until creamy, about 2 minutes. Continue beating and gradually add 210 g sugar, then 2 and 1/2 tbsp flour and a pinch of salt. Continue by adding 1 an 1/4 tsp vanilla extract and the zest and juice of 1 lemon. Whisk in 3 eggs plus 1 yolk, one at a time. Continue on low speed and add 200 ml soured cream (if you don’t have soured cream, use regular cream and add a good squeeze of lemon juice instead). Whisk to blend, but don’t over-beat. The batter should be smooth, light and somewhat airy. Brush the sides of the springform tin with some melted butter and put on a baking sheet. Pour in the filling – if there are any lumps, sink them using a knife – the top should be as smooth as possible. Bake for 10 minutes. Reduce oven temperature to 90 C and bake for 25 minutes more. If you gently shake the tin, the filling should have a slight wobble. Turn off the oven and open the oven door for a cheesecake that’s creamy in the centre, or leave it closed if you prefer a drier texture. Let cool in the oven for 2 hours. 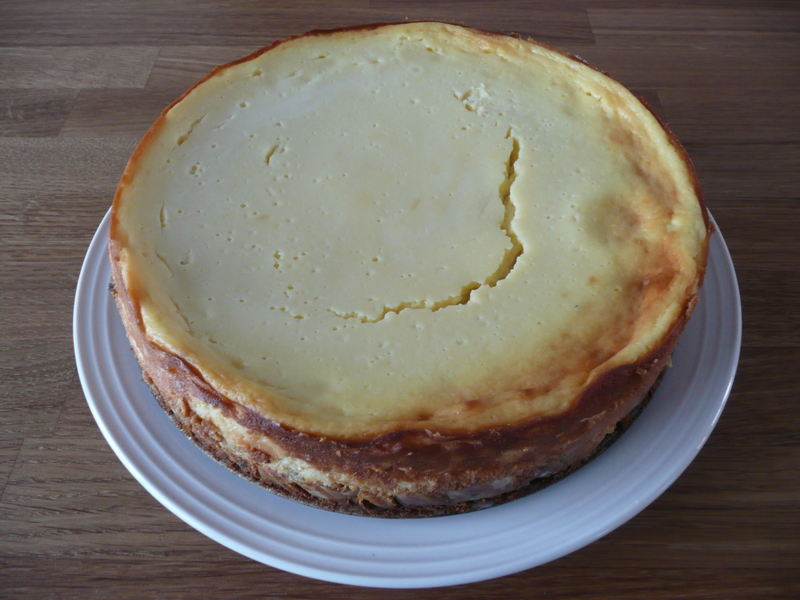 The cheesecake may get a slight crack on top as it cools. Put the cheesecake in the fridge to cool completely. Before taking it out of the tin, run a knife around the sides to loosen any stuck edges. Unlock the side, slide the cheesecake off the bottom of the tin onto a plate, then slide the parchment paper out from underneath. Enjoy while listening to Cheesecake by Louis Armstrong. 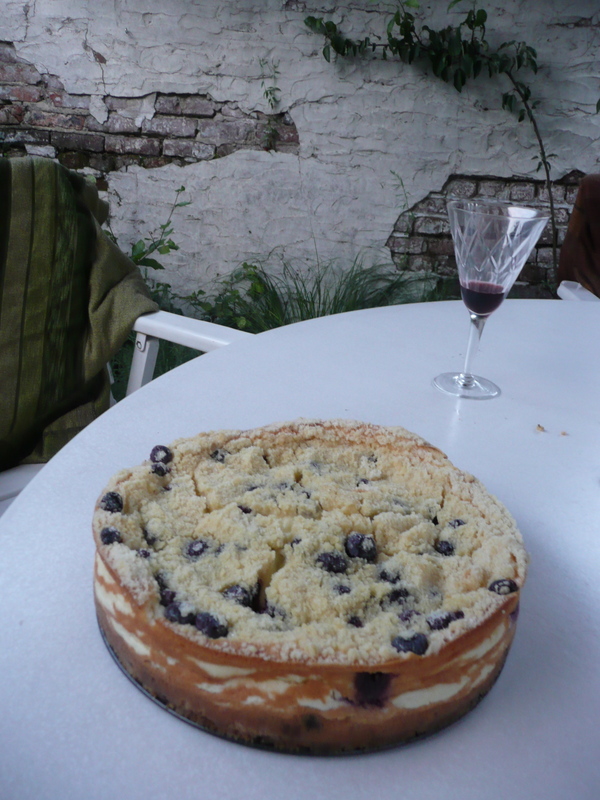 Use up left-over cream cheese in a blueberry crumble cheesecake or to frost a carrot cake or a blueberry cheesecake gateau. One look at the ingredients list for this GoodFood cake and you’ll know why I loved baking it! A nice perk is that it’s super easy to make and there is of course the fun element of decorating it! (and scraping out the left overs of course). Preheat the oven to 160C. Butter and line the base of a deep 18 cm round cake tin (this allows you to make 3 layers. If you don’t have one this size, just use a regular 20 cm cake tin like I did, and stick to 2 layers instead). Put 225 g self-raising flour in a bowl with 1 tsp baking powder, 200 g sugar, 200 g softened butter (if you forgot to take the butter out of the fridge beforehand, just blast it in the microwave for 20-25 seconds. Not longer thought, or it will be melted), 4 eggs and 2 tsp vanilla extract (if you don’t have vanilla extract, you can use the seeds of 1 vanilla pod or a sachet of vanilla sugar instead). Mix together on a low speed until everything is combined. Increase the speed and mix for a couple of minutes more then stir in 1 tbsp milk. Spoon the mixture into the tin and level the top. Bake the cake for about 50-60 min, until the cake springs back when lightly touched and a skewer inserted in the middle comes out clean. Cool, then split into 3 layers with a sharp knife (insert the knife on the side till about halfway, then cut it in a circle, turning the cake as you go). If you used a larger tin, stick to two layers instead of three. To make the icing, beat 400 g medium-fat soft cheese until soft (I used the Belgian soft cheese or Brabantse platte kaas, which is absolutely delicious). Beat in the zest and juice of 2 limes and 100 g icing sugar. You can adjust the taste by adding more sugar or lime juice, depending on how sweet or tangy you like it. If the icing is too runny, just put it in the fridge for half an hour – 1 hour to firm up a little (which I had to do as well). Sandwich the cake back together with two thirds of the cheese mixture and spread the rest on top. Arrange 200 g blueberries in tight circles around the top of the cake. Short for time and need a quick dessert? The cheese icing mixed together with the blueberries makes a delicious variety on fruity yoghurt and will be a guaranteed hit on its own!